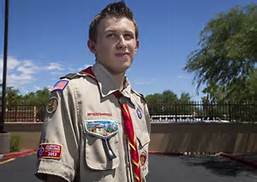 Sixteen-year-old Kyle Tucker attends a charter school in Arizona. The school sits on private property managed by a condominium association. Kyle is also a Boy Scout working on his project to become an Eagle Scout. His project was simple but ran into HOA rules that caused the story to go viral. Kyle raised $400 to put toward a flag and flagpole to be placed in the school’s parking lot. The association told him he would need an insurance policy in the amount of $650,000.00 for the protection of the HOA and building owners. Once the story got out through social media, the HOA backed down and agreed to the installation of the flagpole. Better yet, a local American Legion Post donated the flag and a construction company agreed to supply the pole, concrete and labor. Nice going, Kyle. We’re glad you didn’t throw in the towel on your project. He commented that “Sometimes, things are harder than they have to be, but you have to push through it.” How true.